Do you have any unwanted bikes kicking around in your garage or maybe at your workplace? 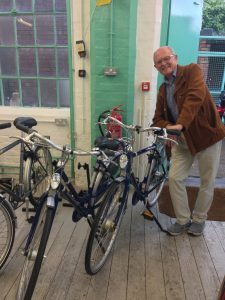 We’re always in need of donated bikes of all types and ages to support our various community activities (Click here to find out more). Decent quality bits and pieces also very welcome. Best if you can deliver to us at our workshops at Units 1-3 Ayr Street, Nottingham, NG7 4FX but we can arrange a collection if necessary. Please get in touch if you can help us, 0115 979 2433. The best bikes we service and sell on at very reasonable prices to support our other activities. Middle grade bikes we keep reserve for participants on our various school and community ‘build-a-bike’ projects. The lowest grade bikes we strip for useful parts and recycle the rest. Children’s bikes we sell at nominal charge at our periodic kid’s bike sales.